Mystic Hot Springs is located the middle of nowhere in Monroe, Utah. But it’s relatively near Capitol Reef National Park and the intersection of I-70 and I-15, so it’s a manageable detour from other southern Utah adventures. 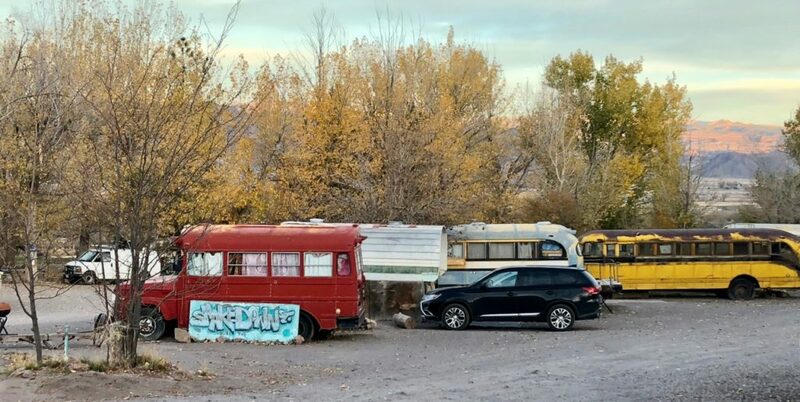 Plenty of people also travel long distances specifically to see this place that bills itself as “the best hippie hot springs in the West.” It’s easy to see why once you get there. I really, really love finding destinations so unique that you can’t help but mutter to yourself, “This is one-of-a-kind. 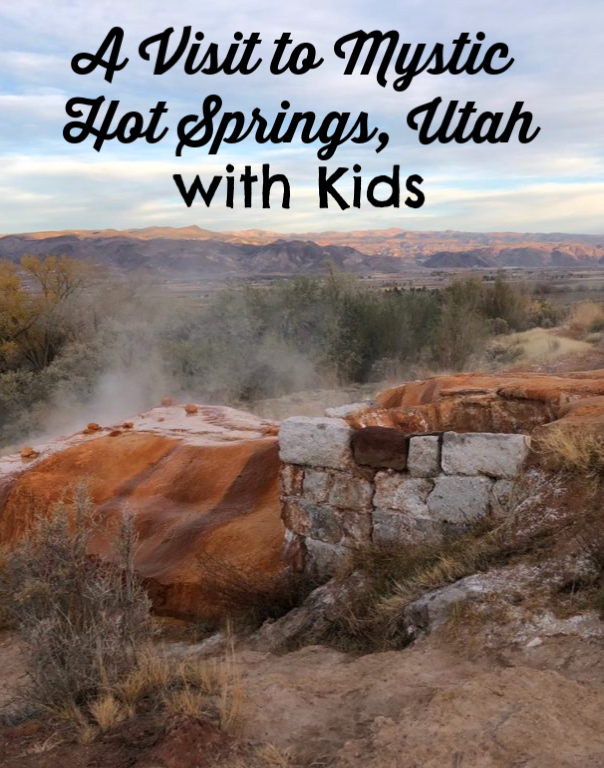 This has got to be the only place like this in the world.” I will travel long distances, and suffer some discomfort and a fair amount of complaining from children to find places like this…which is why I drove so many miles in order to experience the magic of Mystic Hot Springs. 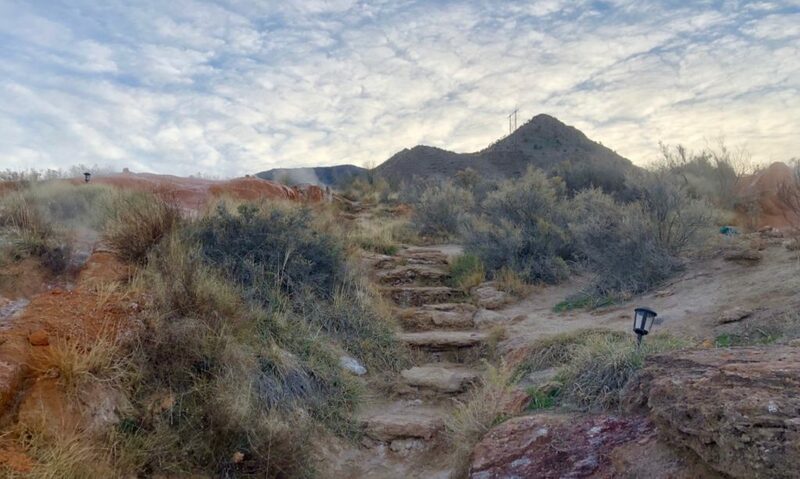 At these hot springs, you can soak your worries away in bathtubs full of healing mineral waters on a pretty hillside, then go to bed in an authentic pioneer cabin or vintage bus. Unless you brought your own tent to camp in, of course. There are options at this magical place. 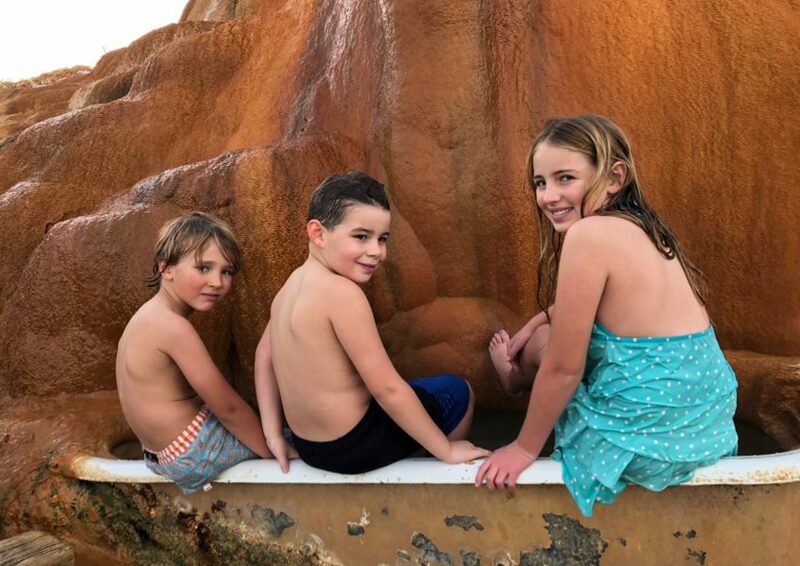 Our kids absolutely loved the main pool at Mystic Hot Springs in Monroe, Utah. It was easily accessible and a tolerable temperature. We all felt healed afterwards. The focus at Mystic Hot Springs is on the natural hot springs, which bubble out of the mountain, leaving red mineral deposits that look like something Disneyland would manufacture out of plastic (my six-year-old actually asked who built it, which might just suggest that he should watch less television). It has a spare desert beauty, and the hot mineral water does indeed soak aches out of bones. It would be a gorgeous, relaxing moment, if you weren’t there with small children. Which, of course, I was. Which meant it wasn’t relaxing, but it was still pretty amazing. Let’s be clear: this is not really a kiddie locale. We happened to be there early on a Sunday morning, which was perfect, because we were interrupting the peace and quiet of only a few other seekers of the healing waters. There are multiple options for soaking, including a larger, easily accessible pool at the bottom, which was great with kids. A few steps up the hill are Mystic’s famous bathtubs, into which run the mineral water. We saw them being cleaned out early in the morning, so I know they are cleaned regularly, and they seemed to be at varying temperatures, with something for everyone. They also have an outdoor swimming pool, which was empty when we were there, although it may just have been drained for the winter. The hot springs are open 24/7. They charge an entrance fee, $15 per adult and $7.50 per child. When the office isn’t open, you can leave your fee on the honor system in an envelope just inside the door. There’s easily accessible potable water from a spigot located just in front of the springs; it’s important to stay hydrated. There are restrooms inside the main office. When that is closed, there is a port-a-potty by the springs. My Cabin is as authentic as it looks, but with electricity and a good wood stove we were way more comfortable than the pioneers, I bet. A friend and I stayed at Mystic Hot Springs for a night with our three kids: two six-year-old boys and a nine-year-old girl. I made a small tactical error by letting my kid believe this was our hotel for the night, a la Super 8, rather than calling it camping, which would have tempered his expectations. Buses suitable for a magical mystery tour…or at least a unique way to spend the night. Mystic Hot Springs has a few vintage pioneer cabins that they’ve fixed up. Sleeping in a cabin is awesome. It probably would have been slightly more awesome with our kids in the spring or fall, when it wasn’t getting down around freezing at night. The most difficult part about the cabin stay was simply that it didn’t have a bathroom. I heard a fair amount of complaining about this, but again, that was probably due to my mismanagement of expectations. The restroom in the office is very close to the cabin, just across the parking lot. When that’s closed, you either have to walk down the hill to the bathhouse for the campground or use the port-a-potty. It was initially cold, as one would expect inside an old cabin without insulation in November. However, I have to say the cabin was beautifully fixed up in an owl motif and they have done their best to keep it warm, with multiple coverings on the windows and across cracks to prevent drafts. There is a wood stove in My Cabin, with plenty of wood provided, and once I got that going we were pretty cozy. There is electricity, and plenty of blankets; all in all it was a pretty comfortable place to stay with a very rustic charm. You should be aware there is no lock on the door, which is consistent with the general camping/hippie vibe of the place. My Cabin has one queen bed on the main floor and one double bed in a loft. This is only a family place if you have older, safe, adventurous kids. The loft does not have a railing and the ladder is steep. The kids we had in tow were climbers who did just fine, but a toddler, for example, would be a disaster here. This would be a great cabin for a family with teenagers. There are three other cabins, and they’re all different. 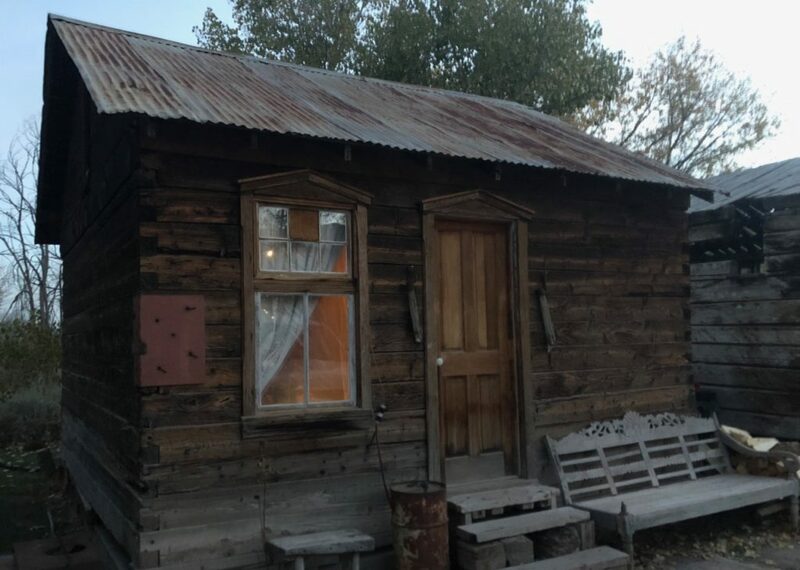 Some are more rustic than My Cabin, some are less; one of them was built in 1865, and one is considered ‘modern.’ For details on the other available cabins, check out Mystic Hot Springs’ website. There are only a few stairs that must be climbed up to the bathtubs — but there are stairs. I did not pack enough food for the kids on this portion of our adventure (total mom fail). Not much is open in Monroe, Utah, late on a Saturday night or early on Sunday morning, and there’s no food available for sale here. Fortunately, the kind people at Mystic Hot Springs pointed us towards the one restaurant that was open in nearby Richfield and we had a very good breakfast at Little Wonder Cafe on Sunday morning. Mystic Hot Springs has a great website and made it very easy to book the cabin and to check-in, even arriving quite late in the evening. It is located at 475 East 100 North in Monroe, Utah, and is easy to find once you arrive in Monroe. Just follow the groovy signs! All in all, I loved Mystic Hot Springs and will definitely be back. To sleep in a bus. I’m thinking with my husband, and without my kids. 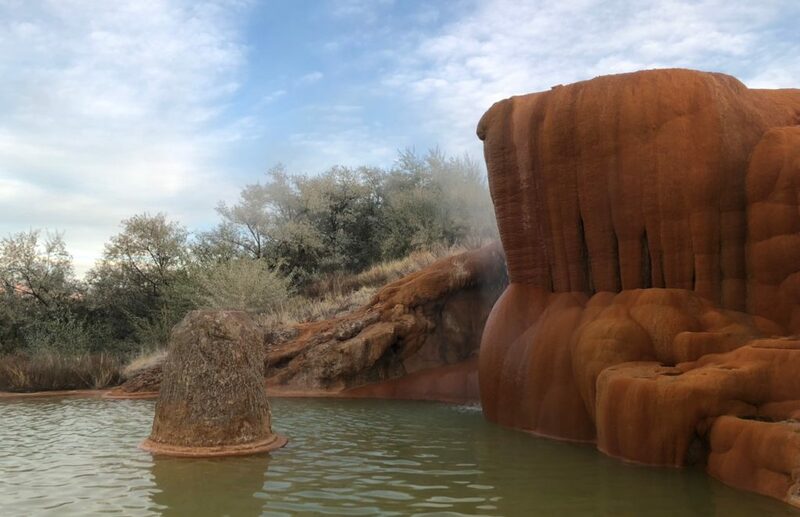 Otherwise I’d say this would be a great stop for a soak with the family on the way to or from Capitol Reef National Park.